In the latter quarter of the 1800's it was not uncommon to find that Viennese clock makers were “bringing in” German factory-made mechanisms and mounting them in Viennese-made cases. The simple economics of producing hand finished mechanisms could no longer compete with the inexpensive German works. 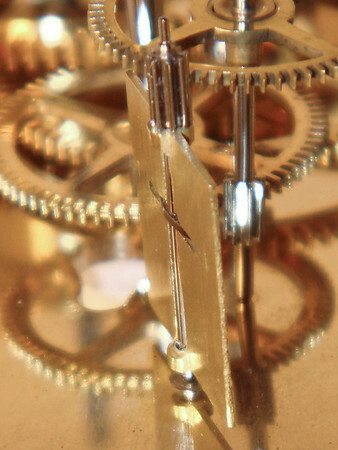 Such is the case with Vienna Regulator-651 – its maker – Eduard Walouschek – installed a Becker mechanism in a case that was clearly made in Vienna. Interestingly, Eduard took the time, apparently, to rectify two of the more obvious short comings of the Becker mechanism – he burnished all the pivots (at least when I went through the mechanisms, they were in better shape and better finished than any I typically see in a Becker mechanism) and he replaced the bent brass strike train fans with exquisitely-machined fans cut from thick pieces of brass. It is also interesting to note that the mechanism mounting plate is serial numbered to match the mechanism. While I have never seen this in a Becker cased clock, perhaps it was something done when Becker was selling mechanisms for use in others cases. An interesting mechanism – and a fascinating bit of history!